For much of the past century, Sweden has not had an exciting political climate. The Social Democratic party controlled parliament for most of the 20th century, but—thanks to rarely having a majority in parliament—it was forced to work with other parties, leading to a strong emphasis on cooperation in government. To an American used to combative politicians spewing rhetoric soaked in vitriol, Swedish politics—generally lacking in contention and animosity—might seem, frankly, boring. But, while politics in Sweden is still considered a serious undertaking better served by civility than animosity, it has become a more volatile, less boring business than in the days of Social Democratic hegemony. The center-right coalition “Alliance for Sweden,” led by the Moderate party, controlled parliament after winning elections in 2006 and 2010 and are seeking to hold power in next year’s vote. Despite leading Sweden to a strong economic performance during the global financial crisis, the Moderates are hurt by high unemployment and a struggling economy and re-election is by no means certain. In fact, polls have been showing that nearly 50 percent of voters are supporting the coalition led by the Social Democrats, while only 40 percent support the Moderate’s Alliance for Sweden. That in itself isn’t necessarily surprising or even interesting. With unemployment nearing eight percent and Sweden leading the Nordic region in youth unemployment, one would expect voters to turn to another option. What is interesting, though, is that the numbers above don’t add up to 100 percent. That is to say, a party outside the usually all-encompassing coalitions is enjoying significant voter support. The Sweden Democrats (SD) is that third (or, technically, eighth) party. An ultra-right wing party birthed in the 1980s from Swedish Nazi fringe groups and other radically racist Swedish movements, SD has taken xenophobia into the Swedish political mainstream. By transforming racist positions into anti-immigration stances (though it is a thin veil at best), the party attracted 5.7 percent of voters in the 2010 election, enough to win seats in parliament for the first time. But blatant racism can only take a party so far, so SD has been working to further moderate its image, branding itself as a traditional conservative party rather than a fringe radical group. And it’s been working. Multiple surveys have placed it as the third-most popular (albeit a distant third) party in 2013.Because of its attempts to rebrand itself as a more traditionally conservative party, it has been stealing voters from the center-right alliance. That puts the Social Democratic party in a very delicate, interesting position. 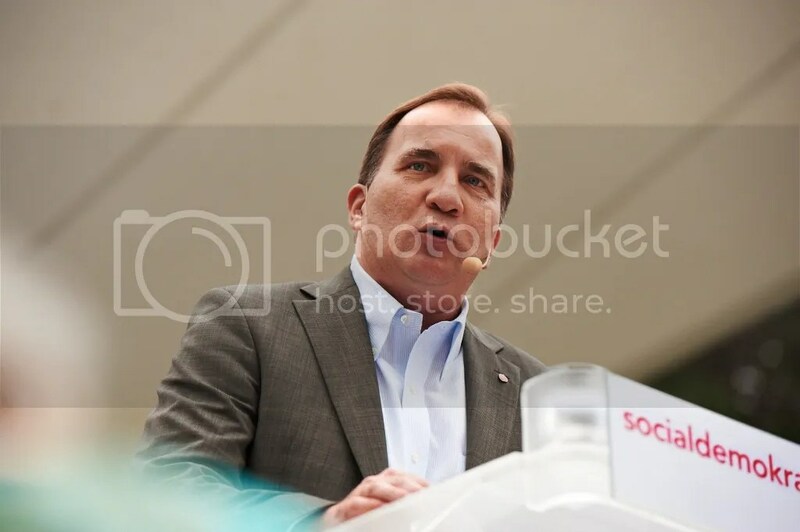 The success of SD will not hurt the Social Democrats like it will the Moderates’ alliance: a traditional Social Democratic voter will not be swayed by SD’s conservative, anti-immigration message. A traditional Moderate voter, however, might. So the stronger SD becomes, the weaker the Moderates become, at least theoretically. And because a weaker Moderate coalition is good for the Social Democratic party, a stronger SD is a good scenario for the Social Democrats, at least by the numbers. The Social Democratic incentive structure created by SD’s rise is somewhat perverse. It is in the party’s interest for SD to have a strong showing in the 2014 election. Thus, it makes sense, on some level, for the party to support SD. Of course, openly supporting SD would ignore all sorts of moral and social responsibilities, and the inevitable backlash would probably far outweigh whatever benefits it produced. So it’s no surprise that the Social Democrats haven’t vocally supported SD and its goals. But they haven’t exactly condemned SD either. Or at least not unequivocally. In fact, their party leader has refused calls from the Moderates to pledge his votes to an alliance to keep SD out of any ruling coalition if needed. That’s obviously not a sign of open support for SD, but it’s certainly not the strong condemnation of a racist party that one would hope to see from the country’s biggest party. In fact, much of the Social Democratic discussion of SD has dismissed its rise—and the potential for it to become a kingmaker during the formation of a ruling coalition after next year’s election—as a nonissue. By not taking substantive steps to limit SD’s political impact, the Social Democrats are bordering on giving the party its tacit approval. Elections are still a year away, and the Social Democrats still have plenty of time to take more concrete action against SD. But if they continue to dance around the issue of a racist, xenophobic party gaining ground in a traditionally open, accepting culture, they will have sacrificed any moral high ground for political gain.